Bhishmaka was making lavish arrangements for his daughter’s marriage with Shishupala. Bhishmaka and Shishupala’s father, Damaghosha, individually performed the propitiatory rituals and offered gifts to the brahmanas with reverence. In the meanwhile, Rukmini was getting restless as the brahmana she had sent to Krishna had not returned even after dusk. She was apprehensive that her action was impulsive and had earned Krishna’s displeasure. She also doubted that it did not have the approval of the divine couple Maheshvara and Parvati, their tutelary deities. While Rukmini’s thoughts were oscillating between uncertainty and hope, the brahmana’s arrival in the inner apartments infused life and delight in her. When Bhishmaka heard of the arrival of Balarama and Krishna, he thought they had come with eagerness to participate in the wedding festivities of Rukmini. He extended a wonderful welcome to the honourable guests. 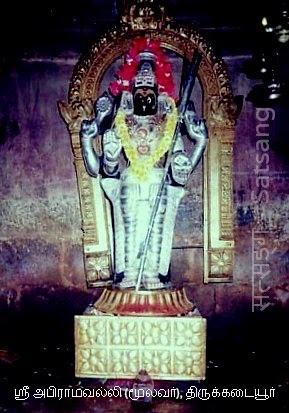 வார்க் குங்கும முலையும், முலைமேல் முத்து மாலையுமே. ஏ, அபிராமி! நான் எத்திசையை நோக்கினும் உன்னுடைய படைகளாகிய பாசமும், அங்குசமும், வண்டுகள் மறைந்திருக்கும் மலர் அம்பு ஐந்தும், கரும்பு வில்லும், என்னுடைய துன்பங்களெல்லாம் தீர்க்கக் கூடிய திரிபுரையாகிய நின் திருமேனி அழகும், சிற்றிடையும், கச்சையணிந்த குங்குமம் தோய்ந்த மார்பகங்களும், அவற்றின் மேலே அசையும் முத்துமாலையும் என்கண்முன் காட்சியாய் நிற்கின்றன. (எங்கும் பரந்தவள்). vaark kunguma mulaiyum, mulaimel muththu maalaiyume. Abhirami! You are the Thiripura Sundari who has killed all my sufferings. Which ever direction I look,, there your graceful appearance with your weapons ‘Pasam' and ‘Angusam' five-flower arrows with honey bees sitting on them, sugar cane bow, your sacred physique ,slender waist, with your bosoms fastened and KumKum mixture (fragrant paste) smeared on the bosoms and pearl necklace are all seen. The following is an excerpt from the anugraha bhashanam of His Holiness Sri Bharati Tirtha Mahaswamiji - Sringeri Sharada Peetham. 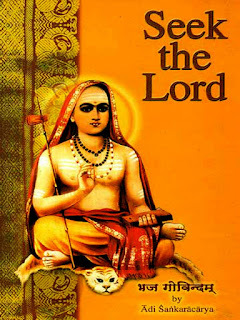 There are many who question if the teachings of Sri Adi Shankaracharya apply to the 21st century. His teachings are so universal that they apply for all time. 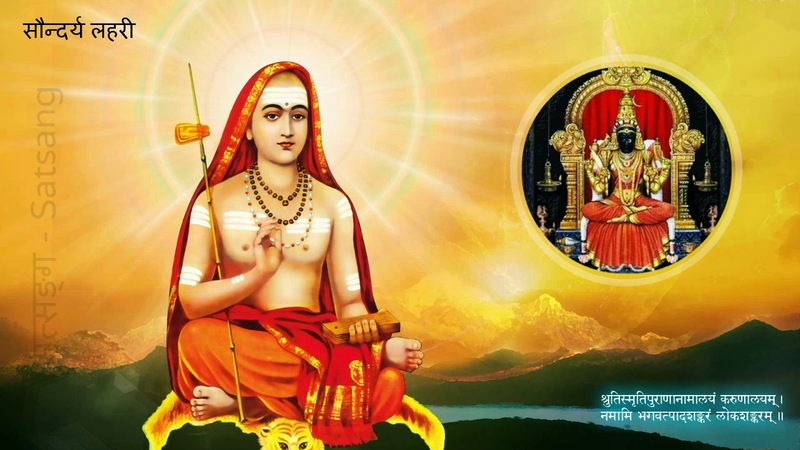 Sri Adi Shankaracharya wrote Prashnottara Ratnamalika, a series of questions and answers conveying deep philosophical truths. For instance, Sri Adi Shankaracharya raises the question - what is most difficult for man to attain. तुम कौन हो, मैं कौन हूँ, कहाँ से आया हूँ, मेरी माँ कौन है, मेरा पिता कौन है? सब प्रकार से इस विश्व को असार समझ कर इसको एक स्वप्न के समान त्याग दो . Vishwakarmaa, the divine architect had employed all his excellent skills in building it and the gods had lavished all their divine embellishments on the city, which was situated in the middle of the ocean. 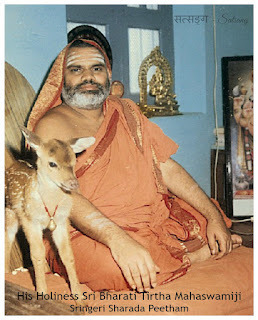 At the instructions of Brahmaa, the king of Revata gave his daughter Revathy in marriage to Balaraama. On this event with all the Yaadavaas, who had assembled, Thou happily performed a great festive celebration. When Rukhmani the daughter of king of Vidharbha, Who was deeply in love with Krishna and wanted to marry lord. Rukhmani who was greatly in love with you, for a very long time, becoming deeply dejected, By this sudden decision against her wishes, Sent a Brahmin with a message, To inform lord about the pain created, By the God of love in her. That Brahmin reached speedily your great city, And became pleased by Krishna, Who is an expert in destroying the sorrows of the world, Received, honoured and worshipped him. ப்ரஸவாரிஷ்ட நிவ்ருத்தி Controlling people who are wicked, quarrelsome and hostile. Quick and easy delivery in the case of pregnant women. ஏ, அடியார்களே! என் அபிராமி, இடையில் ஒளிவீசும் செம்பட்டு அணிந்தவள். 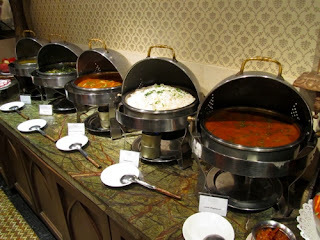 ஒளி வீசும் பிறைச் சந்திரனை அணிந்த சடையை உடையவள். வஞ்சகர்களின் நெஞ்சிலே குடி கொள்ளாதவள். ஒளி விளங்கும் நுண்மையான நூலிடையாள். சிவபெருமானின் இடப்பாகத்தில் குடி கொண்டவள். என் அன்னையாகிய இவள் அந்நாள் என்னை அடிமையாகக் கொண்டாள். 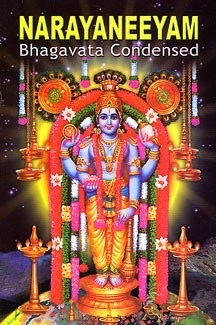 என்னை இனி இவ்வுலகில் பிறக்க வைக்க மாட்டாள். அத்தகைய தேவியை நீங்களும் தொழுது போற்றுங்கள். நீங்களும் பிறவி எடுக்காப் பேறெய்த அவளையே தியானம் செய்யுங்கள். Oh! Devotees! My mother Abhirami pervades through all the worlds. She possesses everything found in the world. She clads with resplendent silk. She wears the bright moon on her matted hair. She does not reside in the hearts which do not have love in them. Abhirami is slender waisted. 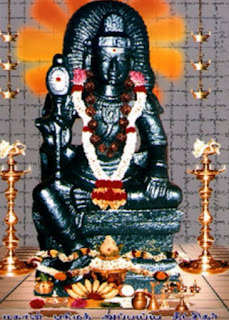 She is present on the left half of my Lord Shiva. She will not make us return in this world again. You all praise and bow down to her feet. Should you want freedom from birth, death cycle, you meditate on her only. रथ के नीचे आने से फटे हुए कपडे पहनने वाले, पुण्य और पाप से रहित पथ पर चलने वाले, योग में अपने चित्त को लगाने वाले योगी, बालक के समान आनंद में रहते हैं . Thou went well adorned with Uddhava to the house of Sairandhree who had given perfumed unguents to Thee while entering Mathura), who, ever since then, had been stricken with love for Thee and was always looking forward to Thy visit to her house and therefore adorning herself and decorating her house day after day, in anticipation of that great event. உரவும் குலிகமும், கற்பகக் காவும் உடையவரே. uravum kuligamum, karpagak kaavum udaiyavare. Abhirami! austere saints and heavenly beings place fresh flowers unto your fragrant-Lotus-feet and they bow down to you in worship night and day. They (austere saints and heavenly beings) who worship you night and day are living with the blessings of royal crown, white elephant, Akasha Ganga, (celestial river Ganga) the weapon Vajra; and all wishes- giving- Karpaga grove. Abhirami! you bless me also with the above gifts and come now. बार-बार जन्म, बार-बार मृत्यु, बार-बार माँ के गर्भ में शयन, इस संसार से पार जा पाना बहुत कठिन है, हे कृष्ण कृपा करके मेरी इससे रक्षा करें. Soups: Most restaurants prepare soup using Stock. Stock is essentially water in a pot that is on sim (i.e. getting heated slowly), with veggies and flavour enhancing pieces (e.g. Bones). In most cases, the restaurant will have one stock pot and it will of course have the bones in them. So when a soup is prepared, the same stock water is used. Immunity from accidents, fear of poison and attainment of all desires. வெளியாய்விடின், எங்ஙனே மறப்பேன், நின் விரகினையே? ஏ, அபிராமி! வண்டுகள் ஆர்க்கும் தாமரையில் வாழ்பவளே! பேரழகானவளே! உலகமெல்லாம் ஒளியாக நின்ற, ஒளிவீசும் உன்னுடைய திருமேனியை நான் நினைக்கும்தோறும் களிப்படைகின்றேன். அக்களிப்பின் மிகுதியால் அந்தக் காரணங்கள் விம்மிக் கரைபுரண்டு, பரவெளியாகவுள்ள ஆகாயத்தில் ஒன்றி விடுகின்றன. இவ்வளவு பேரருள் காட்டியருளிய உன் தவநெறியை நான் எவ்வாறு மறப்பேன்? (மறவேன் ஒருபோதும்). veliyaayvidin, engngane marappen, nin viraginaiye? Abhirami! you are the Goddess, present in the Lotus flower full of honey-bees. I have become spiritually enlightened while I see your effulgent physique, which brightens the whole world. In that state my joy runs boundless like flood and my happiness figuratively also flows towards plains. I will never forget your skill and austere path with which you blessed me. जिन्होंने भगवदगीता का थोडा सा भी अध्ययन किया है, भक्ति रूपी गंगा जल का कण भर भी पिया है, भगवान कृष्ण की एक बार भी समुचित प्रकार से पूजा की है, यम के द्वारा उनकी चर्चा नहीं की जाती है. After taking Their baths and finishing all other morning duties, Krishna and Balarama could hear the beating of the kettledrums in the wrestling camp. They immediately prepared themselves to proceed to the spot to see the fun. When Krishna, and Balarama reached the gate of the wrestling camp, They saw a big elephant of the name Kuvalayapida being tended by the mahout. The mahout was deliberately blocking their entrance by keeping the elephant in front of the gateway. Krishna could understand the purpose of the mahout, and He prepared Himself by tightening His dress before combating the elephant. He began to address the mahout in a very grave voice, as resounding as a cloud: "You miscreant caretaker, give way and let me pass through the gate. If you block my way, I shall send you and your elephant to the house of death personified." பிணங்கேன், அறிவு ஒன்று இலேன், என்கண் நீ வைத்தபேர் அளியே. ஏ, அபிராமி! என்னிடத்தில் நீ வைத்த பெருங்கருணையினால் நான் கள்ள நெஞ்சம் உடையவரிடம் நெருங்க மாட்டேன். உலகத்தில் மற்ற சக்திகளெல்லாம் உன்னுடைய பரிவாரத் தேவதைகளேயாகும். ஆதலினால் நான் அவர்களை வணங்க மாட்டேன்; ஒருவரையும் போற்றவும் மாட்டேன்; நான் அறிவில்லாதவனாயினும், என்னுடையதெல்லாம் உன்னுடையது என்று உன்னை வணங்கும் சில ஞானிகளோடு மட்டுமே பிணங்காது சேர்ந்து உறவாடுவேன்! pinangen; arivu onru ilen; en_gan nee vaiththaber aliye! Abhirami the beauty! all other demi-goddesses are your retinue.Therefore I don't salute anyone,neither I sing in praise, except you! I don't mingle with evil minded people. I don't differ with people who have surrendered all their belongings. It is your boundless mercy that showers the above fortunes on an ignorant simpleton like me.